After four decades of rapid growth (Brown, 2014), the number of Latino immigrants in the U.S. reached a record 18.8 million in 2010, but has since stalled, according to a Pew Research Center analysis of U.S. Census Bureau data.1 Since 2000, the U.S.-born Latino population continued to grow at a faster rate than the immigrant population. As a result, the foreign-born share of Latinos is now in decline. 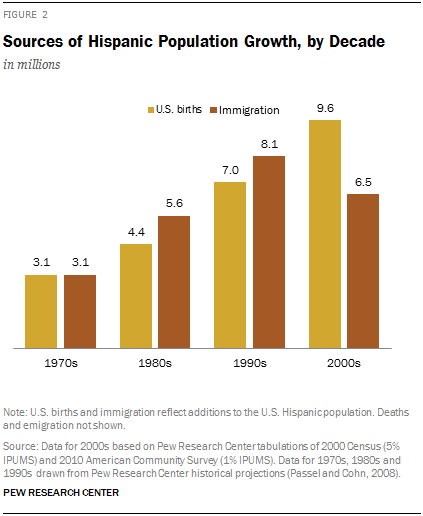 Even as the share of Latino immigrants decreases, rapid growth in the number of Latino births means the Latino population will continue to grow at a steady clip. Latinos are the nation’s largest minority, and one of its fastest growing. Since 1970, the Latino population has increased sixfold, from 9.1 million to 53 million by 2012. It is projected to grow to 129 million by 2060, according to the latest projections from the U.S. Census Bureau (2012). Its share of the U.S. population, currently at 17%, is expected to reach 31% by 2060. These opposing trends—the rise of U.S.-born and the slowdown in immigrant population growth—have begun to reshape the adult Hispanic population. Just as the slowdown in immigration has occurred, the number of U.S.-born Hispanics entering adulthood is beginning to accelerate. Today, some 800,000 young U.S.-born Hispanics enter adulthood each year, but in the coming decades, that number will rise to more than a million annually (Taylor, Gonzalez-Barrera, Passel and Lopez, 2012). Accompanying this report is a statistical portrait of the nation’s Hispanic population and a statistical portrait of the nation’s foreign-born population. Both are based on the Census Bureau’s 2012 American Community Survey and feature detailed characteristics of each population at the national level, as well as state population totals. Topics covered include age, citizenship, origin, language proficiency, living arrangements, marital status, fertility, schooling, health insurance coverage, and employment. Between 2000 and 2012, the percentage of Hispanics ages 18 and older who have never married increased from 29% to 37%. Meanwhile, the percentage that is currently married has declined from 55% to 46%. The share of Hispanics living in households led by married couples has also declined since 2000, from 65% to 57%. The percentage of Hispanic-headed family households with five or more people has declined since 2000, falling from 31% to 26% in 2012. There has been an increase in two-person households, from 24% in 2000 to 28% in 2012. The top five states by Hispanic population in 2012 are: California (14.5 million), Texas (10 million), Florida (4.5 million), New York (3.6 million) and Illinois (2.1 million). Between 2000 and 2012, the five states with the fastest-growing Hispanic populations were: Tennessee (up 163%), South Carolina (161%), Alabama (157%), Kentucky (135%) and South Dakota (132%). The five states where Hispanics make up the biggest share of the population in 2012 are: New Mexico (47%), California (38%), Texas (38%), Arizona (30%) and Nevada (27%). About 12.3 million Hispanics ages 5 and older (26%) speak English at home exclusively. That share is 39% among the U.S. born and 4% among the foreign born. Some 35.5 million Latinos ages 5 and older (74%) say they speak a language other than English at home, whether or not they also speak English at home. Among them, 35.3 million say the other language they speak is Spanish. Among Hispanics (ages 5 and older) who speak a language other than English at home, 56% report speaking English very well. One-third of all Hispanics (33%) say they do not speak English very well. Among immigrant Latinos, a language gap exists between children and adults. Some 70% of immigrant children between ages 5 and 17 say they speak only English or speak English very well. By comparison, just 32% of immigrant adults say they speak only English or speak English very well. Among households headed by Hispanics, 46% are owner-occupied. By comparison, among households headed by whites, 72% are owner-occupied, as are 43% of black households and 58% of Asian households. Some 48% of native-born Latino households are owner-occupied. By comparison, 44% of immigrant Latino households are owner-occupied. Among Hispanic immigrant household heads, the homeownership rate is higher among those who have lived in the U.S. longer—59% for those who arrived before 1990, compared with 14% for those who arrived in 2006 or later. Some 29% of Latinos did not have health insurance in 2012. By comparison, 11% of whites, 18% of blacks and 15% of Asians did not have health insurance. In 2012, about half of foreign-born Hispanics (49%) lacked health insurance, compared with 18% of native-born Hispanics. Among non-citizen immigrant Hispanics, 61% had no health insurance. This report examines nativity trends among the U.S. Hispanic population in the 50 states and the District of Columbia. Accompanying this report are demographic and economic profiles of the U.S. Hispanic population and demographic and economic profiles of the U.S. foreign-born population. This report was written by Jens Manuel Krogstad and Mark Hugo Lopez. The authors thank Jeffrey Passel for editorial guidance. The accompanying statistical profiles were compiled by Anna Brown and Eileen Patten. Anna Brown number checked the report. Caroline Klibanoff was the copy editor. Find related reports online at pewresearch.org/hispanic. The terms “immigrant” and “foreign born” are used interchangeably in this report. “U.S. born” or “native born” refers to persons who are U.S. citizens at birth, including those born in the United States, Puerto Rico or other U.S. territories and those born abroad to parents at least one of whom was a U.S. citizen.